Dan and Hayden pull up at the Cobb and Co. Museum, where they get their hands dirty at the forge and anvil. Then at 'From Paddock to Potager', they meet sustainable farming entrepreneur Fiona and learn about her advocacy for awareness of where food comes from. Later, Dan makes his Duck Papardelle and Hayden whips up his notorious Gluten-Free Chocolate and Blueberry muffins. 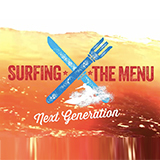 Surfing The Menu: Next Generation was broadcast on SBS ONE at Tuesday 12 February 2019, 04:30.